It is hard to believe that we are nearly a month into the second term. It has indeed been an eventful first term but the second is never a slow ride either. Apart from it being an exam term, there is also much in stall on the co-curricular programme. The winter season started with two hockey festivals, a derby day and two sports tours while our musicians have performed in the Loeriehof fundraising concert and a local concert on campus. Little Oaks have had their book dress-up day, which is always a blast. In this letter, I want to cast the light on some of the exciting developments in progress at Oakhill, as some people might not be fully aware of the bigger picture when their children are involved in a particular phase. Our new cricket nets on the school campus are heading for completion. The project was driven by a group of volunteer parents without whom the job could not possibly have been done this well. Thanks to their generous offer of time, expertise and labour we will now have a top class facility available to junior and senior cricket players. Thank you! In progress at the moment is the building of a 5km mountain biking track at the OSC, to be completed by the end of term. Such a track has been a dream for a long time, until a number of parents and friends of the school, who are also MTB enthusiasts, decided to make it a reality. Much thinking was invested in designing a track that will be accessible to riders of all abilities while also meeting MTB racing standards for events such as the Spur School Series. Although the committee driving the project managed to raise a good amount towards the construction of the track, they are still inviting the Oakhill community and friends of the school who are keen to use the facility to contribute towards its completion. If you are keen to know more about the opportunity to help complete the track and ride it in future, please contact Karine Trollip on k.trollip@oakhill.co.za . Go and have a look, the next time you visit the OSC. Thank you to the committee members and contributors. The new covered tech area is a welcome addition to the hockey astro at the OSC. This creative project was started nearly a year ago and the final structure is not only pleasing on the eye but also answering in a great need at the astro. Those of you who frequent the tuckshop will know how desperately we needed to cover the area directly outside the service hatch. During the Easter holidays, Bruce Burrows constructed a sturdy and aesthetically pleasing cover outside the tuckshop which has turned it into a most inviting space. It is a pleasure to notice how much this space is enjoyed by our pupils and parents alike. Thank you, Bruce! The sports department has been in discussion with SANPARKS over the past few months to look into the possibility of permanently floating two water polo pools in the lagoon. If this project progresses according to plan, we will have these pools on the water in time for the start of the water polo season in September. The pools will be used for training as well as fixtures. 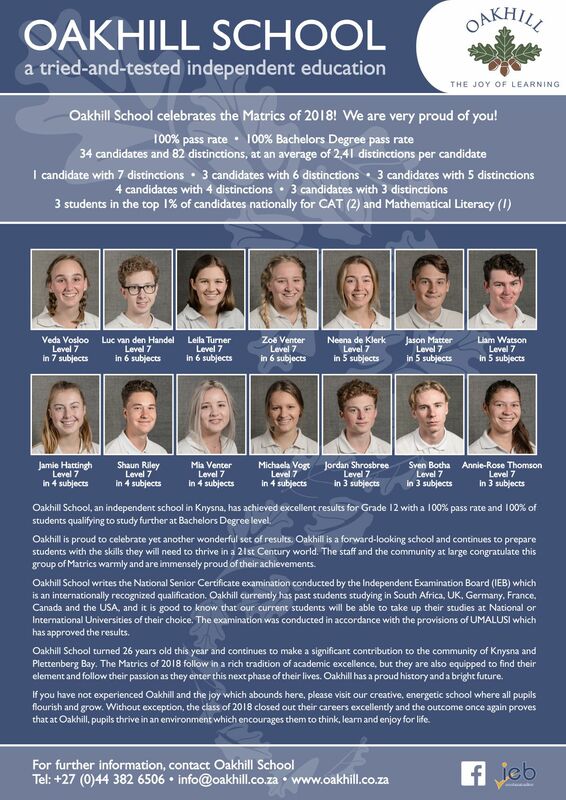 If you would like to find out more about this project or contribute towards making it a reality, please contact the Director of College Sport, Brendan Keevey, on b.keevey@oakhill.co.za. We are continuing with the blending of digital technology into our learning, teaching and workflows. Since our switch to the Google Suite for Education and the roll-out of Chromebooks in the IP (Grade 4-7), ‘cloud-based anytime anywhere collaborative digital learning’ (what a mouthful!) has become a reality in our school. We have started offering coding from the IP to Grade 9. In the Grade 8 and 9 Technology class, the coding programme is combined with an exciting robotics module. We are learning a great deal as we progress in this area, realising that exceptional teaching and learning is a journey rather than a destination. The academic staff started this year with a two-day training workshop on Kagan structures for cooperative learning. Kagan structures have been used with success by teachers in the Prep already but we want to implement these more deliberately in the entire school. Extensive research has shown a significant positive correlation between these cooperative learning structures and academic results. In the Pre-Prep, we are in the process of introducing the Reggio Emilia approach this year, following the training of our Little Oaks staff. Reggio Emilia is a pedagogy described as student-centred that utilizes self-directed experiential learning in relationship-driven environments. The approach is based on the principles of respect, responsibility, and community through exploration and discovery. Our Foundation Phase remains to be the place where the groundwork is done for developing core academic, social and emotional competencies. The FP continues using their C-Strategy for guiding effective teaching and learning. The ‘Reading is Fun’ initiative that was launched in the FP last term has gained good traction in its aim to make little people fall in love with literature. The FP will shortly be offering the ‘Back to Basics’ workshop, hosted by our FP Academic Director, Alexa Frost, in partnership with local occupational and speech therapists. We have successfully switched to a 10-day-cycle timetable for the entire school this year. The College timetable was designed with capacity for an additional choice subject in Grade 10-12. This change means that senior pupils can now fit any one of the following into their school day: an additional subject, AP Maths, AP English, ORT research time, individual music lessons and homework time. The new timetable also enabled us to fit in Technology for Grade 8 and 9, in which pupils are introduced to robotics, coding and other digital competencies. “Every child has the right to feel safe at all times.” At Oakhill, we believe that it is important to be equipping our students with the skills of protective behaviour. We have partnered with Hilda O’Callaghan (from Australia) to train a number of our teachers in the Protective Behaviours Programme which enables people of all ages to develop the life-long skills of assertiveness, self-confidence, problem solving, communication, resilience and help seeking. We are very pleased to offer an information talk by Hilda about the importance of empowering your child through Protective Behaviours and also to provide more detail about the Protective Behaviours Programme that she offers. This talk will take place on Tuesday, 22 May, from 17h30 – 19h30 in the Learning Commons. There is no cost involved, but you need to book your seat at school reception (044 382 6506) to help Caroline Paton and her team manage the venue set-up. At the end of term one, I had the rare privilege of joining the Grade 10s on their Odyssey journey for five days. It was a treat to share with the boys and girls the contrasting experiences of hiking through the lush Knysna forest and the barren Langkloof and scaling the Prince Alfred Pass on mountain bike. I am busy reading the letters that our Grade 10s sent me after their 36 hour solo. I wish I could share with you the deep thinking and insight evident in their reflections. It might be a bit dramatic to suggest that the Odyssey is a life-altering journey but it is a rite of passage for our pupils that will always remain a landmark experience associated with their Oakhill schooling. The Oakhill Careers Day last week was a remarkable event that drew together children from a number of schools in the community. Pupils learned a lot from our guest facilitators who represented a wide range of occupations and careers. We were fortunate to welcome Gill Marcus as our keynote speaker on the day. I was thrilled to hear Gill challenging young people to consider their career options by bearing in mind the purpose they want to serve. Why do you do what you do? This is the question that helps us find meaning and fulfilment in the career we pursue. She urged everybody to be the change they would like to see in this country by having the courage to state what they stand for, but also what they stand against. What a profound message to all of us! improvements to the front of school which should be finished to be celebrated on 7th June. 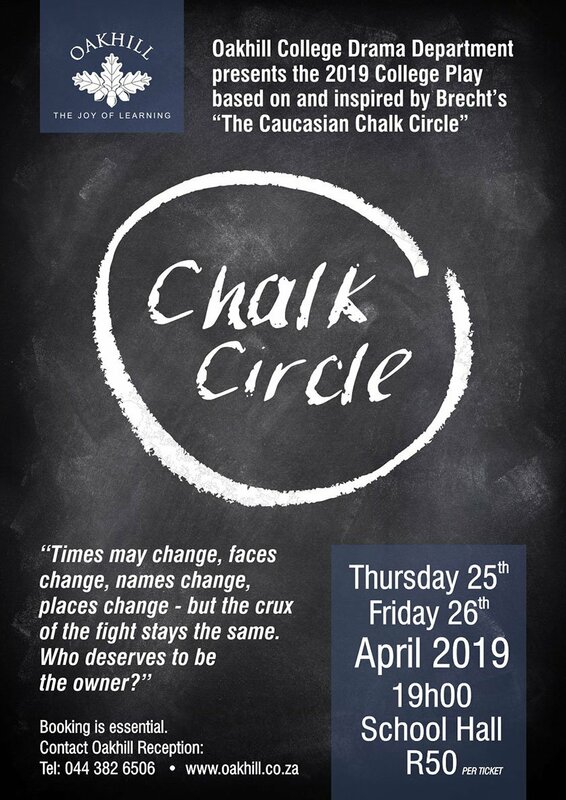 In addition, the Prep Art department will also be driving an initiative on the day, aimed at helping our children express their thoughts and memories upon reflexion on the events of a year ago. As always our pupils keep astounding us on a daily basis with their exceptional individual and team achievements in the classroom, on stage and in the sporting arena. Without fail, alongside them are the teachers, coaches and parents in support. Go and visit our school webpage and facebook page to see how much we have to be proud of and thankful for. Let us remember that the ‘headlines’ report on the tip of the iceberg, really, as we have five hundred children in the school – each on a journey of making progress, mastering skills, overcoming obstacles and achieving personal victories as they learn.